Leaving home and becoming independent is hard, but for most of us this is something we don’t have to think about. Young people leaving the care system are not as lucky. The transition from children’s to adults’ services can be tough. This week is Care Leavers Week. The theme is ‘Reach for the Sky’. 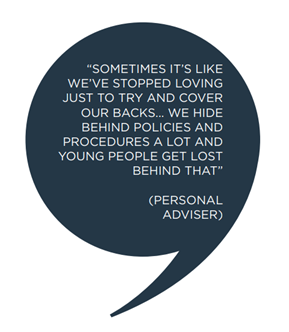 We asked some personal advisers and young people how they could be supported to do this. What happens when young people leave care? Leaving Care teams are committed to supporting young people. But young people do not always get the support they need to reach their goals and aspirations. For those who do, their successes are not always celebrated. PAs want to spend more time with young people. There are a large amount of admin requirements that currently take up PAs time. Young people want to have more of a voice over their transition to independence. Managers don’t always know where services can be improved because they have limited data on what is going on. Every young person Leaving Care must have a pathway plan which should be updated every 6 months. The young person’s personal adviser (PA) is responsible for managing this. The PA should ensure that the needs in the pathway plan are met and the plan is up to date. Analysis showed that only 5% of PA time is spent on the pathway plan. Young people reported that they don’t feel like they have much ownership over their plan. Only 16% of the pathway plans analysed by Leaving Well recorded that the young person had a copy of their plan. Young people told us that action-focused pathway planning would be useful. Currently 70% of the text in the plans reviewed was a description of past events. Half of leaving care teams felt there were no learning opportunities for their young people. How can we support young people to reach their goals? We asked PAs and young people how they could be better supported to reach their aspirations. Brett works for Barnet Council. He has care experience. Do you think young people are supported to reach their aspirations? How do you think we can better support young people to do this? In Barnet we have a charity called Live Unlimited. The charity works to inspire and support the hopes and dreams of Barnet’s Care Leavers http://www.liveunlimited.org.uk/. Dan is a personal adviser at the London Borough of Havering. How can we support young people to meet their aspirations? Do you think enough support is available for young people? A lot of support is available for young people to achieve their goals and aspirations. However, not everyone is in a space where they are able to access this support effectively. It comes down to supporting young people to live independently. Teaching independence skills from an early age, as any parent may do, may alleviate some of the anxiety of independent living. This may give space to think about goals and aspirations in a more timely manner. In my experience by the time young people are ready to leave care they have so much occupying their minds that their thoughts about goals and aspiration drop. They suddenly have to do 101 things and they can’t think about their goals! They become entangled in the anxiety of failure. So how can we improve things for young people? Not all young people can or wish to stay in foster care post 18 so they need a midway care package. They need to be able to live safely with support and company of other people so that they can achieve independence with the correct level of support. In the current climate we can best support young people by ensuring that they are aware of the support available to them and how to access it. Young people are best placed to let us know how we can best support them. They need to be encouraged to take the lead on planning for their future. We should help them to take control of their own destiny. How are Leaving Well approaching the problem? 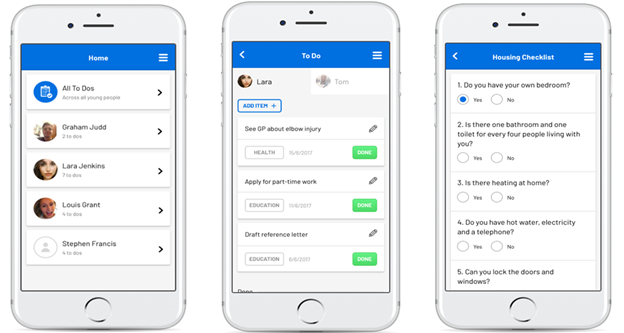 Enables personal advisers to spend more time with young people. The tool makes admin tasks quicker and easier to complete. Provides managers with information on their services. This can be used to identify areas which should be improved. This tool is just part of the solution. By working together across the sector can we provide support for every young person. Only then will they be able to reach their own goals. Social Finance works in partnership to develop new solutions, including through #SocialImpactBonds, to society's most difficult problems. We partner with government, social sector and the financial community to find better solutions to society’s most difficult problems.